The spectacular, salty-air'd spread of ice plants is a springtime favorite. Ice plants are one of the mondo sights around Monterey County in April and May. PACIFIC GROVE... and other spots around Monterey County are rather lush with lovely ice plant cover come the spring. 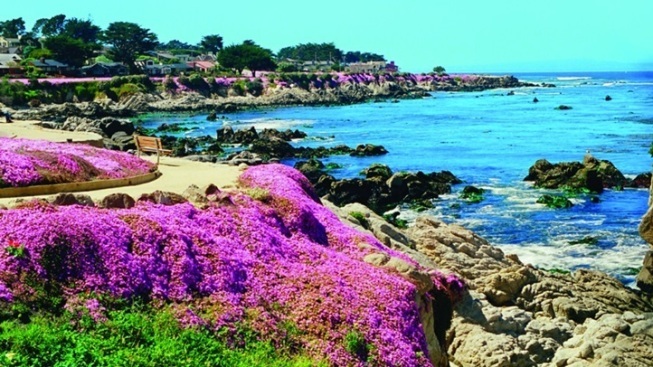 The Monterey Bay Coastal Recreation Trail is a dependable spot for magic carpets come April and May, with "magenta" being the hue of the area. If you can't wait for later April to see this yearly display, The Monterey County Convention & Visitors Bureau has suggested a number of other spots in the area to witness the wowza springtime show. Find poppies, wild irises, sky lupine, and daffodils, as well as other flowers, along trails, in parks, and near the Pacific in the coming weeks. Delightful details? They're blooming on this page now.